Not just famous for the Beatles, Cilla Black, football, its music heritage and one of the worlds most famous ports, Liverpool also has the largest collection of museums and galleries in the UK outside of London, and most of them being free-to-enter. Experience the untamed majesty of Ireland's West Coast with striking seascapes, maritime history, and an island adventure with a day trip to the largest of the Aran Islands, Inis Mor. Enjoy some of the most glorious scenery Britain has to offer as we explore the rolling hills and soaring mountains of the Lake District. We will be staying a few minutes walk from the charming Edwardian resort of Grange-Over-Sands where you will find quaint cafes and shops, a wonderful promenade, fine parks and gardens. All holidays include: Coach travel, bonding, bed, breakfast and evening meal unless otherwise stated. 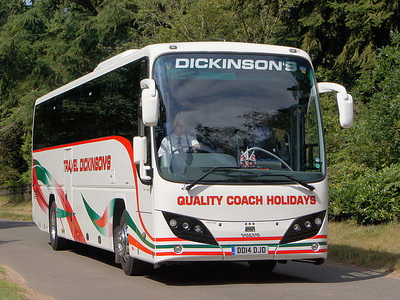 D & J Dickinson Coaches no longer offer travel insurance for your holiday but it is a condition of booking that you are adequately insured for any of our holidays. On payment of your deposit we will request that you provide to us details of your insurers, your policy number and the emergency contact number as stated on your policy. We will be happy to provide a leaflet from our preferred insurance brokers, Towergate Chapman Stevens, which will give you information on how to purchase travel insurance from them if you wish to do so.